The Christian culture that has underpinned Western society for centuries has been eroded. We're now at the point where to disagree with people on issues such as marriage and sexuality, is seen as hateful. Christians are no longer seen as honourable, but as bigots. But history testifies that the more people try to destroy Christianity, the more it grows. So we are entering an exciting period of time because we’re back in the place where Christ’s church can thrive - at the margins of society. This is a much-needed reminder that gospel Christianity thrives when it is out of power, and that Christian courage comes from trusting not in cultural power but in God’s power and grace. This is a deeply encouraging book. I mean that literally: it brings courage to the reader. It is also enjoyably punchy, readably short, practically wise and pastorally insightful, with a warmth and winsomeness that books on this subject sometimes lack. Get hold of a copy, and be en-courage-d. Fearing, agonizing, retreating, embracing. These are a few of the responses we see and might be experiencing in a ‘post-Christian’ culture. Chandler knows how many of us feel in our current cultural moment in the West. 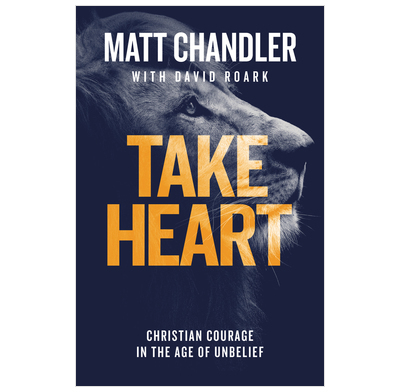 Through biblical truth, Chandler helps redirect our eyes to the One who can strengthen and encourage us so we might have courage. A small book that packs an enormous punch and is just so encouraging. Will be looking to purchase multiple copies to give to family and friends. A much needed word of encouragement in today's culture. This is an easy read, yet very insightful book. I’ve heard the argument many times from those around me in my parents small country town - “America is a Christian Nation!” When, in reality, it’s not. America is a melting pot of different cultures and beliefs. Matt brings that mind set front and center in this book. I think it’s a great book for my 17 year old to read so I’m going to pass it along to her as well.